Lock in a great price for St. James Guesthouse – rated 8.5 by recent guests! 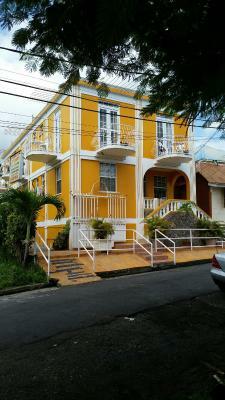 Reasonable location around 10 minutes walk from the centre of Roseau. A nice touch was being able to watch the sunset from the rooftop. There is a nice restaurant and bar on the premises. Internet TV was also available. The bar -- the fish dish at dinner. The internet worked reasonably well. Perfectly satisfactory rooms. Staff was friendly easy walk to the ferry terminal and the market. Breakfast was good. Had dinner their one evening and it was tasty as well. WiFi worked well in rooms. Small rooftop space to watch the sunset. The whole guesthouse is very clean with great amenities and the on site restaurant is excellent, as well as the breakfast. The rooms are very clean and spacious and comfortable, a great size. The space had wifi and a kettle so we could make tea, and the bathroom was clean and cozy. The location was also great, we felt safe walking around and walked all over Roseau. Everything. Food was excellent. Management was excellent. Accommodations were excellent. Was really happy and satisfied with everything. The room was spotless and comfortable and even had a television. There was a wardrobe and air conditioning. What made the stay so great was Phil and Carol and their generosity, kindness and warmth. They even introduced us to their family. They went above and beyond in all ways and helped us in every way that they could. Rooms at the St James Guest house feature functional, home-style décor and include a microwave and fridge. Some rooms have a private bathroom, while others have access to shared bathroom facilities. A daily continental breakfast is included and is served in the Guest house’s bar-restaurant. You can also find local bars, restaurants and markets within a 5-minute walk, in Roseau town center. The Botanical Gardens are within a 10-minute drive of the property, while Melville Hall Airport is a 1-hour drive away. Free private parking is available on site. This property is also rated for the best value in Roseau! Guests are getting more for their money when compared to other properties in this city. When would you like to stay at St. James Guesthouse? This bright, functional room is air conditioned and features free Wi-Fi and a cable TV. The private bathroom includes a shower. This double room features 1 queen-size bed, a balcony and air conditioning. House Rules St. James Guesthouse takes special requests – add in the next step! St. James Guesthouse accepts these cards and reserves the right to temporarily hold an amount prior to arrival. There was limited options for vegetarian food. The location and in particular the parking lot look a bit discomforting (strewn with old car carcasses), but in hindsight, all the island is the same. The room is very small with nowhere to sit except on the bed. The breakfast was a bit on the minimal side The soap appeared in the bathroom only on the second night. Nothing negative about this place. Nice people running the place. Cosy backyard with good dinner, nice bar and fresh breakfast. Good location, only 700 meters to the express des iles (ferry). We really enjoyed the stay. There was a full day where the water was not working properly , not the hotels fault but the city so that was not enjoyable. Phil and his wife state on their business card ; ' home from home ' . We agree . St. James is a nice , quiet and comfortable homely guesthouse . Convenient for the capital Roseau and the buses for all over the Island . Very basic and tasteless breakfast, just two slices of white "gummy" bread, little butter and gem. The onsite restaurant offers not a fancy, but quite overpriced menu. In fact you don't see the price when you order. The only open area where it is possible to seat and read is the restaurant, but if it is not open, the closing time is 20.30, which is leaving you without a choice for the whole evening. The outside area of the hotel is full with garbage and car wrecks. The best feature of the hotel is the location - a short walk from the bus "station", so it is very easy to catch a cheap transport to any point of the island. The price for the room was twice the average price. There was another regular room but management did want to change.